A combination photo shows Joseph Paul Franklin, who has been convicted of killing eight people from the late 1970s to 1980 in racially motivated attacks, in booking photos taken in (L-R) 2005, 2007 and 2012. 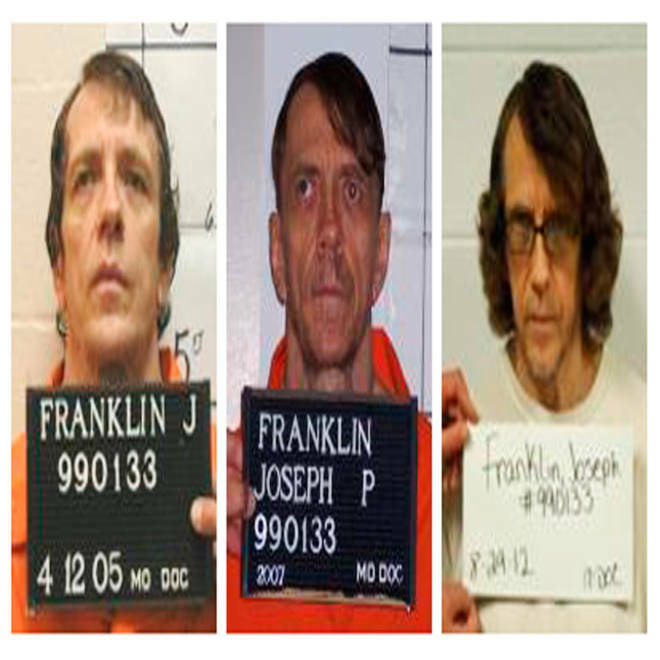 A federal judge in Missouri has given a stay of execution Tuesday to white supremacist serial killer Joseph Paul Franklin just hours before his scheduled death. U.S. District Judge Nanette Laughrey ruled late Tuesday afternoon in St. Louis that a lawsuit filed by Franklin and 20 other death-row inmates challenging Missouri's execution protocol must first be resolved. The 14-page ruling criticizes the timing of the state's changes to how it administers capital punishment. Franklin, 63, was scheduled to die at 12:01 a.m. Wednesday for killing Gerald Gordon, 42, in a sniper attack outside a suburban St. Louis synagogue in 1977. It was one of as many as 20 killings committed by Franklin, who targeted blacks and Jews in a cross-country killing spree from 1977 to 1980. He was convicted of seven other murders, but the Missouri case was the only one that resulted in a death sentence. Franklin has also admitted to shooting and wounding civil rights leader Vernon Jordan and Hustler magazine publisher Larry Flynt, who has been paralyzed from the waist down since the attack in 1978. Missouri had planned to be the first state to use the drug propofol as a lethal drug, but Gov. Jay Nixon ordered the state Corrections Department to come up with a new drug after an outcry from the medical profession over use of the popular anesthetic in an execution. The department turned to pentobarbital made through a compounding pharmacy. Few details have been made public about the compounding pharmacy because it is part of the execution team and state law provides for privacy for all associated with executions. "Throughout this litigation, the details of the execution protocol have been illusive at best," Laughrey wrote. "It is clear from the procedural history of this case that through no fault of his own, Franklin could not resolve his claims without a stay of his scheduled execution date." She added: "Franklin has been afforded no time to research the risk of pain associated with the Department's new protocol, the quality of the pentobarbital provided, and the record of the source of the pentobarbital." Scott Holste, a spokesman for Nixon, had no immediate comment. A spokesman for Attorney General Chris Koster did not immediately respond to a message from The Associated Press asking whether the state would appeal the decision.